Gamestar Mechanic was originally funded from a MacArthur Foundation grant. We collaborated with James Paul Gee to develop a game that would let kids design their own. 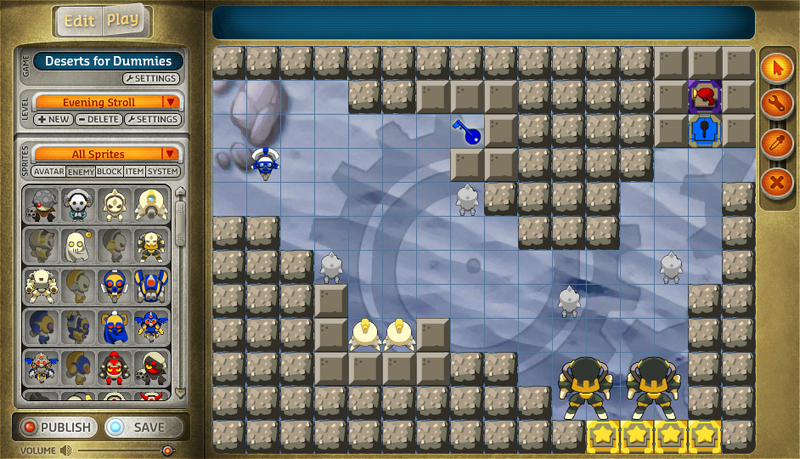 Players use a simple drag-and-drop system to design levels for games, pulling in characters, obstacles, powerups, and interface elements from a sidebar inventory. Each game element carries with it a bit of logic, and you can double-click on anything in the game to modify how it behaves. Gamestar Mechanic can be used to create platform scrollers, top-down shooters, tricky logic puzzles, and narrative adventure games. A large community of players and designers can still be found online. When Gamelab closed, the Institute of Play and E-Line Media took over the project and have done a great job maintaining and expanding the site. Special thanks to Jim Gee and the MacArthur Foundation for initial research and funding.